Evapotranspiration (ET) describes the movement of water into the atmosphere, comprised of water evaporated from surfaces, and water released from vegetation as vapor through leaf openings (stomates). To account for factors such as irrigation that have an impact on ET, the value ETa is used to indicate the actual amount of water passed into the atmosphere. The ability to predict ETa of trees in an orchard is useful to farmers because it provides information about the tree water needs. Equally useful is knowledge of future water availability which is affected by changes in snowpack and temperature. Tools that provide this kind of information assist the farmer in managing irrigation resources, to maximize tree vigor and yield. 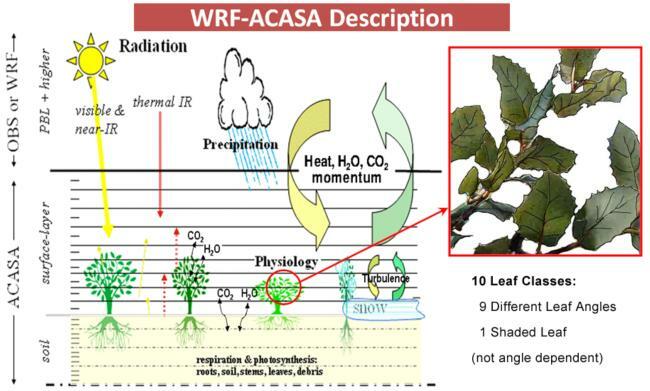 The focus of this program is the improvement of sensing tools, focusing on linking two weather models: WRF (the Weather Research Forecasting Model ) and ACASA (the Advanced Canopy-Atmosphere-Soil Algorithm), to provide farmers with a model for predicting Eta for orchard crops in the Sacramento and San Joaquin Valleys. The WRF is a weather prediction model that was developed through a broadly based partnership of organizations and universities, including NOAA ( National Oceanic and Atmospheric Administration ) and NCAR (National Center for Atmospheric Research ). Among its many users are the National Weather Service, the US military and the National Hurricane Center. The WRF is designed to serve in both weather forecasting and in atmospheric research. As a research tool, it allows us to conduct simulations reflecting either real weather data or idealized data. ACASA is a sophisticated model developed at UC Davis. It simulates the microclimate at the leaf surface, and measures surface energy fluxes, including ET.